Best Buy is starting to offer customers the chance to try gadgets before they buy them. Before you get too excited, this isn’t free, or even cheap. However, the chance to rent a high-priced gadget for a day or a week should appeal to consumers unable to decide on a purchase 11 Tech Purchases You Won't Regret Making 11 Tech Purchases You Won't Regret Making Buyer's remorse is no fun -- but with these 11 tech purchases, you won't have anything to worry about. If you're on the fence about any of them, it's time to buy. Read More . According to Recode, Best Buy will start offering a rental program on its website later this month (June 2017). Customers will see a try-before-you-buy option besides a range of gadgets, and clicking on the option will send them to Lumoid. From there they can rent that gadget for a limited time. The gadgets being offered to rent include cameras, wearables, and high-end audio equipment. Customers who go down this route will earn around 20 percent of the rental price back in Lumoid credits which they can then use if and when they decide to buy the product outright. Renting a gadget is insanely expensive compared to buying it outright. Recode suggests it will cost $50 to rent an Apple Watch Apple Watch Review & Giveaway Apple Watch Review & Giveaway The new Apple thing is finally out, but everyone was talking about the Apple Watch long before it was officially announced. Starting at $349 - we take a look, and have TWO to give away! Read More for a week, as an example. However, spending $50 with nothing to show for it at the end is surely preferable to spending $400 on a gadget you quickly realize you don’t actually want or need. This is a fantastic option for those times when you just cannot decide on a particular purchase. Renting gadgets isn’t cheap, but it’s preferable to spending hundreds of dollars on a gadget which then sits in a drawer. 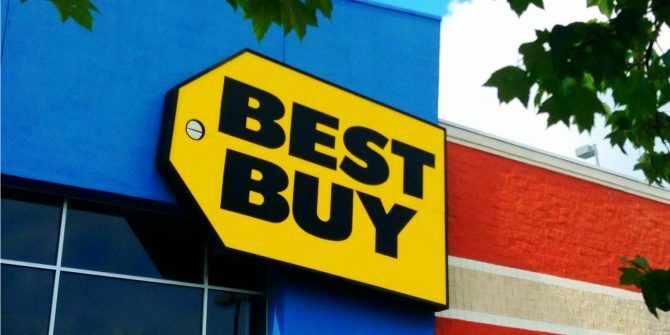 This gives Best Buy an advantage over Amazon, so expect Amazon to retaliate with a similar try-before-you-buy program in the not-too-distant future. Do you currently shop at Best Buy? If so, will you be making use of this option to try before you buy? If not, which big-box retailers do you use instead? Will this rental program make you more likely to switch to Best Buy? Please let us know in the comments below! Explore more about: Gadgets, Online Shopping. The only thing that this might be good for, is renting a big screen TV for the Superbowl, or when you want to make an impression on relatives when they come to visit. If you bought something that you find out later that you hardly ever use, you can always sell it. This way, you've spent money for something that really isn't yours. Most personal electronics are just that...personal. We customize them so much, that you just can't keep them for a week or so and get rid of them. And what about later on when they have this big glut of used product? I'd rather wait and buy these at what should be a huge discount.